Fitness and Health: Beat the Boredom! With the snow and ice outside, my cardio routines have been getting a bit boring…for both mind and body. When my options are limited, I tend to slip into the mentality of “putting in my time” in terms of getting a workout every day…and that certainly eliminates chances of a more intense workout happening. But there are some simple ways to easily increase the intensity of a cardio workout that don’t require sprinting and still achieve your healthy lifestyle goals. Try these ideas to amp up your daily fitness and health routine! The intervals created by throwing in these little bursts of a slightly higher intensity will do wonders for your workout! Raise your hands above your head for intermittent bursts of time during a walk, aerobics class, or while your dancing around your living room! Increase either speed or incline during a walk. Choosing a walking path that includes hills provides natural intervals. No hills? Try increasing speed for a few minutes, then returning to a moderate speed for a few minutes. Try something new! A different mode of exercise challenges the body in new ways. Try enrolling in a kickboxing class, learning to play a sport, or get in the pool. The American College of Sports Medicine (ACSM) recommends that moderate intensity exercise should show up in our schedule most days of the week. The duration of exercise recommended by ACSM includes 20 to 60 minutes of continuous or intermittent bouts of aerobic activity accumulated throughout the day. However, something is always better than nothing. Using these suggestions can help make healthy lifestyle management a way of life! You’ve heard of having a ‘case of the Mondays,’ right? Well, I find I’m more likely to fall under the influence of Friday rather than Monday. On the first day of the weekend, the last thing I want to do is pencil a workout into my last-day-of-the-week schedule. Because everyone suffers at one time or another from lack of motivation in terms of moving their bodies, I’ve put together a nice list of ideas to prevent throwing in the towel entirely on such days. 1. Make plans with a workout buddy. I’ve recently been working out with a friend five days a week, and am proud to announce I’ve only missed one workout this week…and felt horribly guilty about leaving her hanging that day. Though I wasn’t always excited before the workout, I never walked away regretting it. 2. Choose recreation. Have an activity planned especially for low motivation days that’s nothing but fun. Play with your dog, go dancing with friends, or maybe even go shopping – power walking from store to store of course. 3.Create the perfect playlist. If you’re like me, the perfect lineup of tunes can get you through almost anything…and probably even help you enjoy it. Having an arsenal of playlists with different genres of music can help you feel satisfied with what you’re hearing while in any type of mood. 4. Plan a reward. The right incentive can go a long way. A movie night with the girls, that new pair of shoes you’ve been eyeing, or giving yourself permission to sleep in an hour later the next morning might be all you need to push through your workout. 5. Phone a friend. I have a girlfriend that I can call up at any time who is prepared to motivate me at the first sign of giving in. Awhile back I told her I needed her to be that motivational buddy who I can pull from whenever I need an extra push. She’s never failed me. Of course, some days our bodies really need a break. It's most important to enjoy movement and listen to our body's cues...even if that means hitting the hay early and moving tomorrow when it can truly be enjoyed. The annual holiday food fight is about to begin. You know, the one where conflicted women nationwide (even worldwide) face down rich-food eating traditions. This year, to help women understand what doesn’t work when it comes to happy holidays, the healthy-weight experts at Green Mountain at Fox Run have come up with some sure-fire tips to take the guesswork out of gaining those holiday pounds. We counter them with sensible advice for emerging from the holidays feeling great. · Diet! Diet! Diet! Let’s face it, you expect to overeat during the holidays so why not get a jump on weight loss now? If you’re feeling truly ambitious, try dieting during the holidays, too; the deprivation will be highly effective at driving you to overeat. Our real advice: Learn to eat what you want now in a way that leaves you feeling great. Then the holidays won’t pose any special challenge, and you can enjoy them fully. · Work out extra hard and long every day. You can make up for those times during the holidays when you won’t want or have the time to do anything. Our real advice: When we overdo on exercise, we’re more likely to burn out, or worse yet, injure ourselves, and guarantee we don’t want to do anything. Slow and steady wins the race. · Start weighing yourself daily. You’ll be able to follow your weight up and down the scale, and cut back even more when you’ve gained an ounce. Then you’ll heighten your feelings of deprivation even more, further guaranteeing holiday overindulgence. Our real advice: Toss out the scale now and for always. It generally doesn’t give the instant gratification we seek, and often negatively impacts our motivation to take care of ourselves. · Take on as much work as you can. If you don’t do it, who will? The holidays just aren’t the holidays without all the fuss! Our real advice: Choose wisely in what you commit to. You may end up with fewer or simpler celebrations but you’ll enjoy the holidays much more. · Surround yourself with family and friends who make you feel guilty about eating. It’s easier to say ‘no’ when your spouse, mother, sister, daughter, friend looks disapprovingly at you as you reach for that wonderful holiday sprinkled cookie. Our real advice: Educate family and friends about the real impact of their attempts to control what you eat. If they won’t listen, minimize your time around them when you’re eating. It may mean missing a party or meal, but you might feel much better as a result. · Forget about stress management for now. You’re too busy!! Just focus on getting what you need to get done. And be sure to really have too much to do before big parties. If you can pick a fight with your spouse on the way to a party, all the better to guarantee extra emotional overeating. Our real advice: Take care of yourself physically and mentally to help keep a balanced view on what’s important during busy times. Maybe the easiest thing to do: Get some exercise! Physical activity refreshes, relaxes, revitalizes and will add energy and enthusiasm to your life. Make it a regular part of your day during the holidays and after. · Make sure every social event revolves around food. If you throw the party yourself, make too much food, especially desserts! Set up nuts and other goodies early so you can pick at them all day long while you skip meals. You do eat fewer calories that way, right? Our real advice: Traditional foods are a big part of festivities, but holidays don’t have to be all about food. Plan fun activities such as pumpkin bowling (knock down gourd ‘pins’ with small pumpkins), a pine cone toss (count how many pine cones you can land inside a hula hoop) or just fun and refreshing walks through the woods, around the neighborhood talking to friends you pass. · Set a ‘hands-off’ rule for all the rich foods you’ll encounter. If you just say ‘no,’ you’ll be able to nip any weight gain in the bud! Our real advice: When we forbid foods or label them ‘bad,’ we set ourselves up for overeating them. Again, learn to eat foods you love – even those rich in calories, fat, sugar – in a manner that makes you feel well. That way, you’ll enjoy them and, if you’re following a healthy lifestyle, you’ll enjoy a healthy weight, too. · Go ahead and buy all those goodies on sale in jumbo packages. They’re for your guests; they won’t create any problem for you having them around. Our real advice: Good intentions aside, mere exposure to food often sets us up for wanting to at least taste it, especially if we’ve got the idea we shouldn’t. Help yourself by buying only as much as you really need, and even then, it might help to keep goodies tucked out of sight in the pantry until party time. · Bank calories whenever possible. Skip breakfast and lunch to make sure you’ll overeat at the party. Our real advice: Feeding yourself well all the time leaves you better nourished and able to choose wisely whether at parties or the food court at the mall. This is the time of year when things seem to begin to spiral out of control. Stress builds with the approach of the holidays, visits from family and friends, the end of the work year, making travel plans, and of course the many celebrations centered around food and drink, making mindful eating difficult. As I began thinking about my own personal quest to try not to let my fitness and health slip during these few months, I landed on the idea that maybe it wasn’t just my body that would need the extra attention. During one particularly busy semester in college – two jobs on top of seven classes – I created a very acute fitness plan for myself. Every day I carved out 30 minutes somewhere for a yoga session, supplemented only with my daily treks across campus. Aside from keeping me in shape, I was more focused and clear-headed than ever before, even with the many responsibilities I held. With stress being a major contributor to a wide array of health problems, a workout that creates peace in the body, mind, and spirit might have far more benefits than one may think. This holiday season, why not couple a workout with some major stress reduction? Try bringing some peace to your body and mind with yoga! Fitness: Stretching - The Magic Bullet? What if I told you I knew a way you could increase your annual salary by 30 percent? Perhaps you’d be more interested if I told you I could make your food 30 percent more satisfying. Maybe I’d have your attention if I could convince you that the same strength-training routine you’ve been doing for years could be 30 percent more efficient. Well, if you know the undisclosed weapon for achieving the first two, go ahead and send that tidbit of invaluable information my way, while I let you in on the secret to locking down the third. It’s a little thing I like to call stretching. Not just for increasing flexibility anymore, stretching after each set done for a particular muscle group can lead to increased strength gains on the size of said muscle group, as well as boost growth abilities. But let’s face it…we think about stretching as we’re speeding through our workout about as much as we pause to think about flossing every morning – a nice touch, but only if we have time. Studies suggest that fascial stretching - a slightly more intense form of stretching – added during rest periods between sets (not even adding time to your normal routine) can amp up muscular strength and size. According to Nick Nilsson, President of an online exercise, fitness, and personal training company called BetterU, Inc, explains how stretching is the solution to avoiding plateaus in muscular strength and development. "Every muscle in your body is enclosed in a bag of tough connective tissue known as fascia. Fascia is important for holding your muscles in their proper place in your body. Because fascia is so tough, it doesn't allow the muscle room to expand. It is like stuffing a large pillow into a small pillowcase. The size of the muscle won't change regardless of how hard you train or how well you eat because the connective tissue around your muscles is constricting the muscles within." Nilsson suggests holding each stretch for 20 to 30 seconds after each set, which also meets American College of Sports Medicine (ACSM) guidelines. He also stresses the importance of stretching following strength training, while the muscle is “pumped up,” or showered with increased blood flow. The fitness staff at Green Mountain at Fox Run leads women through stretches before, during, and after each activity, thus preventing them from being tired, sore, and achy the next day…not to mention super-charging the efficiency of each workout by creating possible strength gains. According to Lynnann Covell, an 18-year fitness staff veteran at Green Mountain, a number of women verbally express improvements in flexibility, strength, and stamina by day three – even participants with arthritis. I don’t know about you, but those effects coupled with the idea that more muscle means greater calorie-burning capabilities has me sold. Enjoy your day – I’m off to stretch! A couple weeks ago, I posted about research that showed reading books that young girls could identify with helped improve self esteem and might be a good way to reach them with helpful fitness and health information. Emphasis on the helpful, which to us at Green Mountain means health at every size [HAES] messages. Fat isn't the problem. Dieting is the problem. A society that rejects anyone whose size or body shape doesn't meet an impossible ideal is the problem. A medical establishment that equates "thin" with "healthy" is the problem. 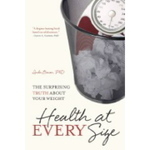 Health at Every Size is not a diet book. Read it and you will be convinced that the best way to win the war against fat is the give up the fight. This is a book with helpful messages that anyone concerned about womens healthy living -- or anyone else's, for that matter -- can really use.